Ian Holm and Penelope Wilton give haunting, sombre, beautifully-chiselled performances in Harold Pinterís haunting, sombre, beautifully-chiselled play, a two-hander, 40 minutes long, and a miniature masterpiece. 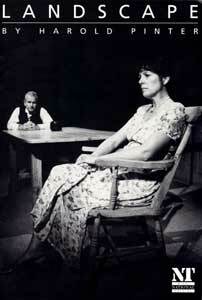 Duff and Beth, middle-aged husband and wife, sit barely moving at either end of an old kitchen table. They live and work in this large house. The master is away: an absentee God. This is a portrait of marriage as a desolate landscape. The dialogue is spare and simple, both remote and pellucid, like lights in a mist. Husband and wife have intertwined and grown inseparably together in shared pain. He is earthier and more ordinary of the two; she is more dreamy, inward-looking, self-sufficient. She has loved somebody once but it was not Duff, and she is secretly nurtured by the memory. Duff knows that he is being excluded but probably doesnít know why. He is the suppliant, living in the urgent present, asking in vain to be heard, to be admitted, and to have his simple strengths recognised. Holm sits like an old stone crumbling from within. Wilton is wistful, wounded, concentrating on the pain which tells her sheís alive. An unforgettable duet.